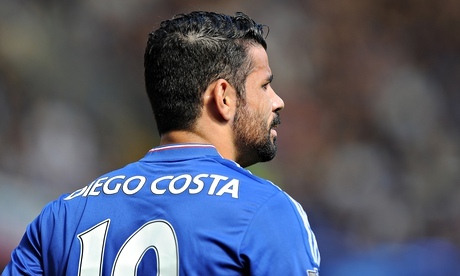 DIEGO COSTA BAN: Outrageous decision by the FA especially as Gabriel GETS OFF! Like many of you, I was disappointed to hear that the FA have decided to BAN Diego Costa for three games as a retrospective punishment for what happened against the Arsenal! It's a joke if you ask me and has only come about because of the knob ends on TV who have created such a fuss about it! I will say this, Costa grabbing Koscielny in the face isn't acceptable but the French Defender then virtually man-handles Costa to the floor which is why Costa gets up and goes chest-to-chest with him for the defender to fall on the floor like he has been shot with his arms flailing about. Then, if you watch the footage again, Gabriel comes in and grabs Costa around the throat which is why Costa reacts the way he did. The whole Costa/Koscielny incident is just handbags and a stronger Referee would have just dealt with the situation on the pitch, calmed it down and that would have been the end of it. However, as we have seen in recent days, the pundits on TV have virtually condemned Costa and have virtually convinced all non-Chelsea fans to hate him, despite admitting they would love to have him in THEIR teams, and now the FA have followed suit and banned him retrospectively! Even worse is the that fact that Gabriel grabs Costa by the throat and kicks out at him and GETS OFF!